February 17, 1960 - a cold, windy, and snowy day - Saab held a press showing in Stockholm. 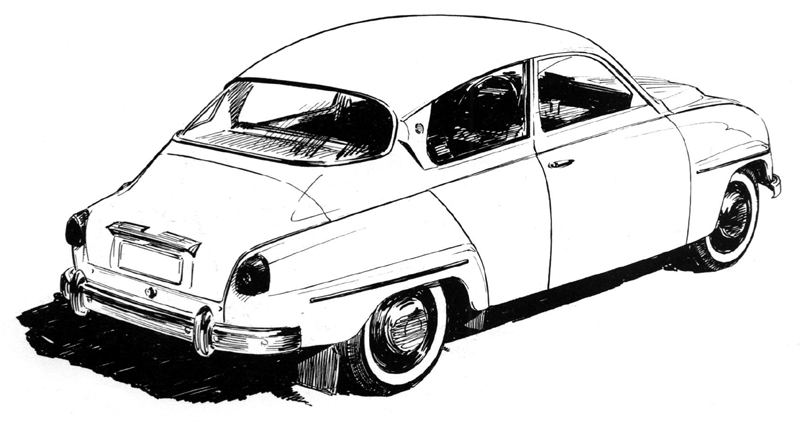 The Saab 96 was introduced. This time the car's rear section had been redesigned, while the front had been left pretty much intact. The list of what made the new car different from its only a few months old predecessor, 93 F, included a larger and stronger engine (841 cc, 38 hp), 117 percent larger rear window, wider backseat, more baggage space, new instrument panel, automatic flow-through ventilation, new rear lights, larger fuel tank and a new body design from the doors to the rear. The model was well received and Saab was easily able to sell everything that could be built ... twice the daily volume of just three years earlier. The latest and just completed expansion of the Trollhättan plant had cost the company some SKr 50 million and included new offices, a new paint shop and new halls for final assembly and adjustments. Annual capacity had reached about 30,000 units. The decision about continued expansion, with a goal of 50,000 units, was reached just before the additions were opened with great fanfare and ribbon cutting in November of 1959. Series production of right-hand-drive models began about the first of the year 1961. A totally redesigned rear end was the most visible new feature on the Saab 96, which arrived in February of 1960, and which internally was called 93 C. It was not ready to be presented as a 1960 model, and the type drawings thus show "Model 1961". 93 F was an interim 1960 model, which gave way to the 96 once the stock of parts was used up. Saab 35 and Saab 96 - one more than 10 times faster than the other. 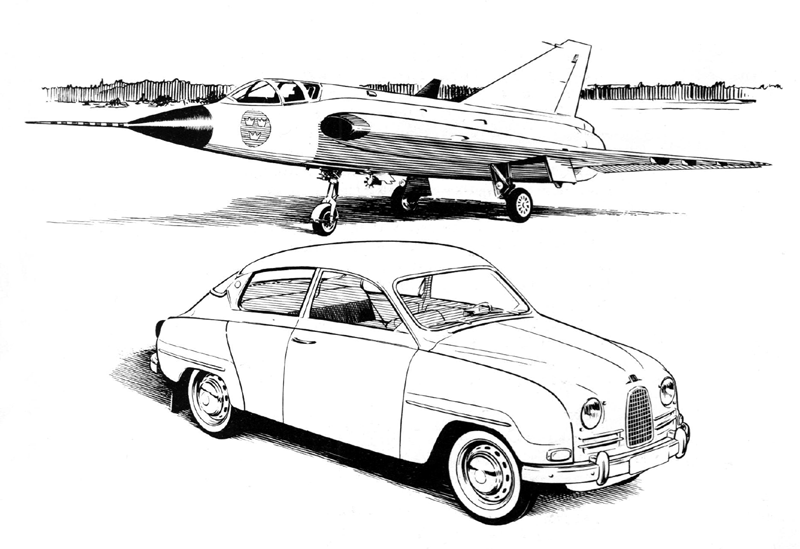 Both were on Saab's production lines in 1960. The X-ray view of the Saab 96 shows how the fuel tank is located between the rear wheels, beneath the flat floor pan. Back seat passengers ride ahead of the rear axle and are not bothered by any drive shaft tunnel. The rear seat is wider and offers more head room.